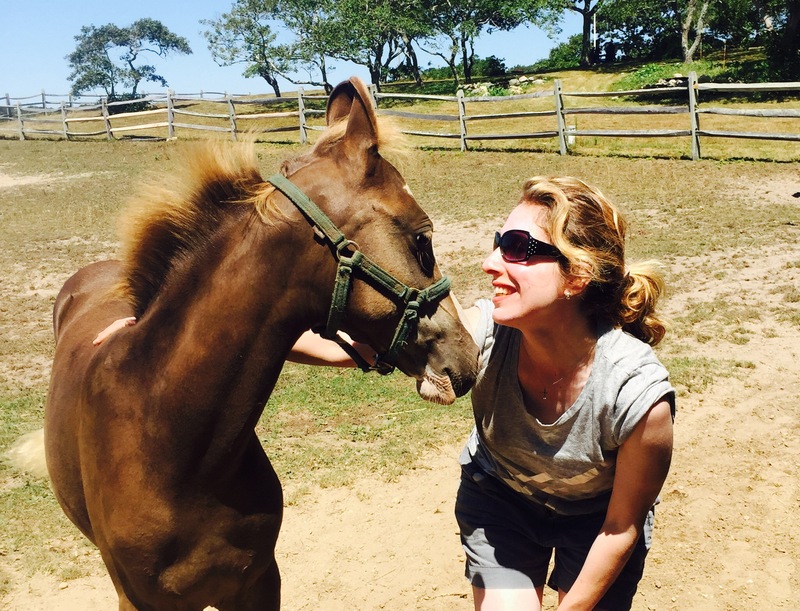 Yesterday I went to visit a colleague and friend of mine, a clinical psychologist who has been developing a livelihood that embodies her passion…horses. 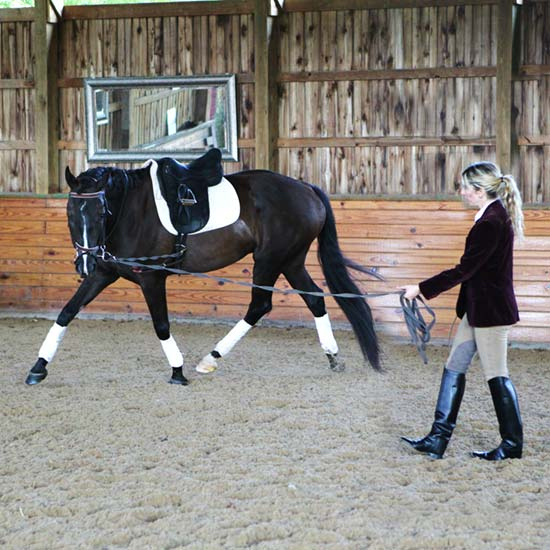 She is renting a beautiful farm that has two barns with spacious, clean stalls and an indoor arena for training the horses and teaching classes. She has a number of clients who board their horses…many of whom have horses which have previously been abused or traumatized. While driving to her farm, I had a deeply unsettling ‘close call’. I arrived breathless, distracted and tense. I found my friend deeply involved in her very full day of caring for her horses so I just jumped in and shadowed her as she moved through her chores. She described the endless nature of the chores as very grounding and noted that they help her to be in the moment and present with the horses. “They speak but we can only hear if our minds are quiet”, she explained. She showed me photographs of one of the horses when she first saw him with his coat dull, head low and eyes lifeless after years of abuse. I couldn’t believe the horse before me could have possibly been that horse in the photograph…now with bright, shining black coat, massive and muscular with his head held high yet totally tuned in and curious about his environment and very attentive and responsive to my petite friend who cooed, spoke endearingly and yet firmly if needed. Soon she wanted me to get actively involved. She encouraged me to use a massage brush with a (big to me) brown, male horse, who had been abused as a working horse out West. She told me the horse would let me know what felt good and pointed out a few areas that he liked where the muscles were still healing. I felt a little intimidated. I had difficulty noticing the horse’s feedback, which she patiently continued to point out to me. Despite being a massage therapist, I was aware of thoughts like, “I’m not strong enough to do this”, “I don’t know how much pressure to use”, “I just came for a visit and she has me working”, “I’m too tense to do this.” etc. My discomfort was painful. At some point, however, I began to settle into the process, with one hand on the brush and the other on the horse, patting him, talking to him. I began to feel the movement of the horse into the brush, as if asking for more. I noticed how he would extend his neck and curl his lips back while extending his tongue when he was really enjoying the area I worked on…not unlike we humans when the massage is a ‘good sore’. I also noticed I was more in my own body and calmer, the thoughts disappearing. Occasionally, he would touch his nose to places where he wanted more massage. My friend explained that when horses are abused it affects the musculature from the neck all the way down the spine. Healing involves mobilizing all these micro muscles, which is challenging for them because there is discomfort for them in doing that. The healing process involves building trust so they will be willing to go to those difficult and sore places they’ve learned to brace around to avoid the pain, losing progressively more mobility. After the horse’s muscles were warmed and loosened with massage, we went to the indoor arena where she asked me to walk my horse around the perimeter of the arena. I noticed how much more present and connected I felt with him now and how much more present I felt in my own body in that time and space. The whole afternoon started to seem timeless. Then she started to lead him through a series of figure eight turns that required him to turn his neck both left and right. The left turn extended the right side which is the difficult side for him. In this process she can see where he is having difficulty in the movement on this particular day. 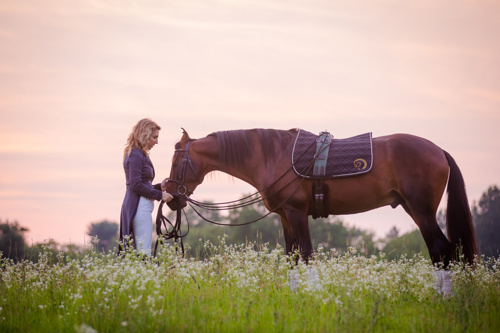 Only after being armed with this important information does she actually ride him to encourage him to gently push the boundaries of what he can do, moving more into the difficult areas, building confidence and trust. I was truly amazed to watch the rider and horse become so seamlessly one, like a dance. She only invited him and he complied to her coos, clicks, snorts (reminding him to breathe) and “good boy’s”. I had arrived at 1 pm. I looked at my watch and it was already 5 pm. …the time had definitely flown! I felt like a different person than when I had arrived, so much more grounded and present. I was so grateful and expressed my deep appreciation to my friend. My horse had shared many lessons with me. Working with him, afforded me a chance to practice with my own pain. With him I relearned the importance of the body and connecting with our experience even when it is painful or unpleasant. I experienced on a deep level that turning toward the painful, difficult or unpleasant instead of avoiding is an “effective way through”. I also saw how our history and experience shows up in our bodies and can take up residence there, whether we are consciously aware of it or not. The paradox is… by bringing attention and gentle awareness to our bodies and what is painful or unpleasant, there is the possibility of change which arises on its own out of that process. I learned that experience, even very difficult experience, by its very nature changes when we approach it with a curious and kind attention…and I learned that our wholeness is never lost.